Hello hello!! I wanted to name this post how to get away with being the laziest person at the bar and no one noticing, then I remembered guys can just put on pants and no one questions them. Anyways, this weekend I was having a chill night and somehow I was convinced to go out. I didn’t want to spend a ton of time getting ready, so I went into my closet and looked for clothes that I could wear and it would look like I spent a lot of time getting ready. This gets much easier in the summer/ spring when clothes are less bulky, but since we were down in the 50s that day I had to make do. So I went for boots, jeans, and a pretty casual top. 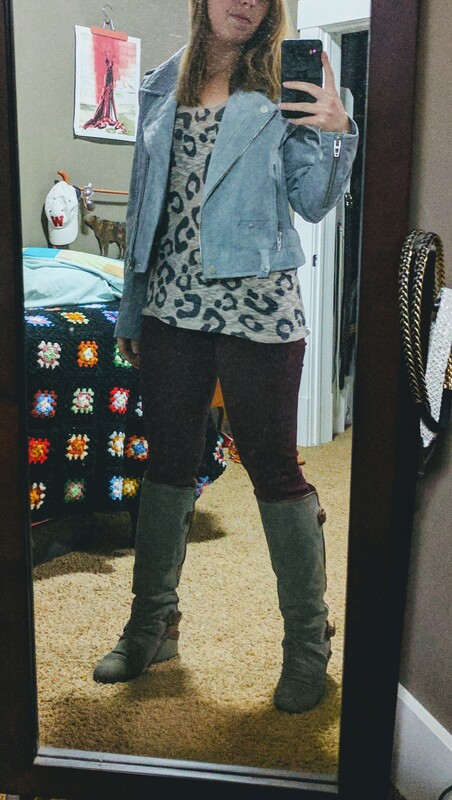 The reason this outfit really works and doesn’t look like it was just thrown on is due to the colored jeans, animal printed top and the leather jacket. The colored jeans, I love to have these in my closet to mix in because she you wear them it’s unexpected and people tend to think you put more thought in rather then just throwing on regular jeans. Animal printed tops are great if you don’t own one please buy one, I prefer zebra print. This one is actually a giraffe printed top, I got it years ago and it’s just been a great top that I can throw on. As with the colored jeans most women don’t just throw on an animal printed top, so when you do it comes off as a statement. (And it looks really great with the burgundy jeans). Lastly, the leather jacket it’s just the toping on the outfit. Finishes everything off and looks amazing. This was my first time wearing the jacket and I could not be happier. This light grey color didn’t really match the grey of the boots which I will put as a slight critique but the jacket is amazing I couldn’t pass up wearing it. It’s the blank NYC jacket, if you want the link I’ll get it but it was expensive. Well worth the price in my opinion. 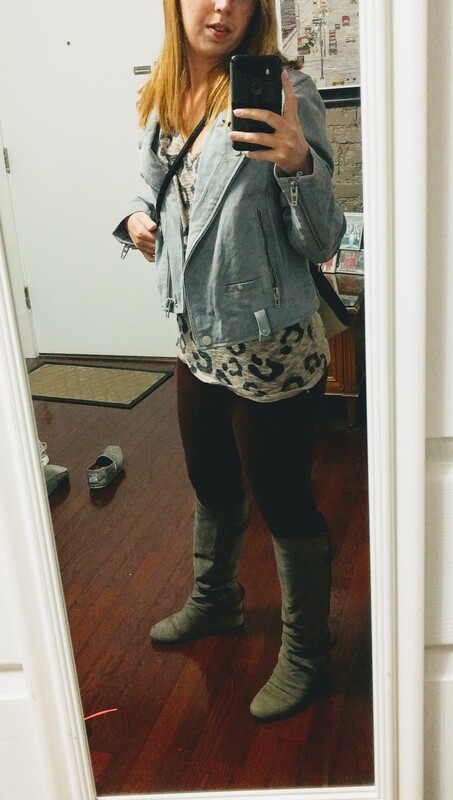 Posted on April 23, 2017 by goodclothesopenalldoorsPosted in Boots, Going Out, Shoes, StylistTagged animal print, Boots, goingout, styleblogger.